I tend to think of myself as someone who treasures solitude, perhaps because my normal work world and home context, offer scant moments when I am ever truly alone. Now I suddenly find myself in a situation where I am recovering from a near breakdown, unable to travel far without being overcome by fatigue and vertigo and, so it seems, my work colleagues are under instruction to refrain from all contact with me. Now if I was off work due to some tangible medical ailment, oh you know, a physical injury or illness or some other condition necessitating tests, scans and possible surgery, I would be able to expect calls, cards, hospital visits. Instead I am in a virtual isolation chamber. I have a mental illness and suddenly the years of highly productive contributions I have provided to my employers seem to have been rendered null and void. A crushing ball of loneliness to which I am entirely unaccustomed sits in the pit of my stomach. Would anyone even notice if I failed to return save for the mass of paper I left behind on my desk? One might wonder how the workmates of the unnamed narrator of Seven Terrors made sense of his failure to return to the office when, after the dissolution of his marriage, he took to his bed and refused to emerge from the confines of his bedroom for nine long months. That is exactly where this dark gothic tale by the Bosnian author Selvedin Avdic begins. Long listed for the brilliant Impac Dublin Award for 2014, I read this book a few months back but I find its haunting mystery and curious endnotes continue to resonate with my present frame of mind. Translated by Coral Petkovich and published by Istros Books in 2012 (re-released in 2018 with an introduction by Nicholas Lezard), it is the sudden visit from the daughter of a former colleague that drags our apparent hero from his self imposed exile. She beseeches him to help her locate her father who has been missing for years and intrigued, perhaps more by the young lady than any curiousity about his friend’s fate, he agrees. Thus he embarks on a most dingy and disorienting detective adventure. Set in 2005, the war in Bosnia a decade earlier is a constant presence throughout the book. Although few events are recounted directly; the memories, mythologies and human losses linger in the bitter winter wind, seep through cracks in the plaster and creep across the floorboards. With a clear nod to Borges, Kafka and others this dark tale is an entirely contemporary fantasy. Yet as the investigations turn to the missing journalist’s interest in coal miners, Bosnian mythology begins to play a strange role and our narrator’s sanity (already questionable one might argue from his bedsit starting point) becomes increasingly ungrounded; even as he tries to make sense of himself and the truth behind the dissolution of his marriage. It is strange how magic, reality, fantasy and fact can mingle in literature – and for this purpose I am excluding fiction that fits explicitly into fantasy and horror genres where such mutability is a given – but capital “L” Literature, which being a bit of a bookish geek is my typical but not exclusive, terrain. Yet in real life, that life we are forced to venture into outside the covers of a book, there seems to be some caveat on TRUTH as if that was even an objective possibility. And what is crazy anyway? When I work with a survivor of brain injury I can sense the difference between psychosis and confabulation and the inability to lay down new episodic memories. But if, under exceptional professional stress, I became agitated, overworked and frustrated is my sanity at stake? I heard no voices, had no visions but I sure was moody and irritated. I should think that my fictional Bosnian friend burying himself in his bedsheets for nine months was in worse shape than I but as a character he is a fascinating narrator to spend time with. Or so I thought. 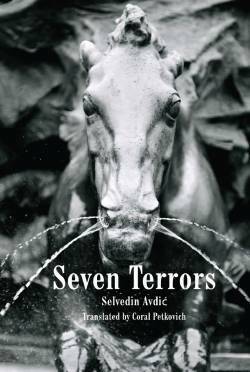 And obviously enough people agreed to nominate Seven Terrors for the Impac Dublin Award which draws its nominations from the selections of a wide range of international libraries. Better to write and describe it like this – fear of loneliness or darkness. It’s all the same, they both devour. Turn on the light and read this book. It’s a European thing. You wonder what Kafka’s cockroach guy’s friends thought when he failed to appear at his favourite cafes for yonks – but there you are! Yes, I read this post this morning but must have got distracted before I could comment. It sounds like an excellent and moving book. Love your comment about caveat on truth. Your comments remind me of an indigenous writer here who objected as I recollect to her work being described as including magical realism. To her there was no distinction in the realities she was describing. I understand that totally from an intellectual point of view, but I struggle to find the words to describe it given the culture I grew up in. I love having my assumptions tested like this. Thank you. At the moment most of the books I chose to write about reflect back to my recent mental health setback in some way. Kind of like reading therapy. I like magic realism but it has to be very good. This book defies characterization but the approach taken fits very well given the recent history of the area. This is an Istros publication but they are so hard to come by in Canada. Previous Previous post: What lies ahead?